Looking for something fun, different and a little mystical for your next gathering? 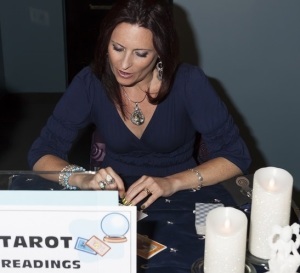 Treat your guests to a unique, interactive and memorable Tarot experience at your next party or gathering. My services are great fit with birthdays, bachelorette parties, girls’ nights out, Hallowe’en, New Year and other holiday gatherings. I am always met with rave reviews for my skill, approachable nature and insight. Not to mention flexibility and reliability. In a large party situation, I keep the readings short, light and positive, usually about ten minutes per person. This gives everyone else a chance to try, to get a taste of Tarot! I tell the truth of what I see in the cards, but I always leave guests feeling happy, uplifted and with a story to tell! If you are planning a smaller, more intimate gathering, we can do longer reads which allows for more depth and insight. We hired Lori for an office birthday party and I was so impressed by her professionalism, easy going nature and passion for connecting with people. This started as a fun idea for a party, but we all walked away from our readings with insights we weren’t expecting! I wouldn’t hesitate to recommend Lori’s services to anyone! 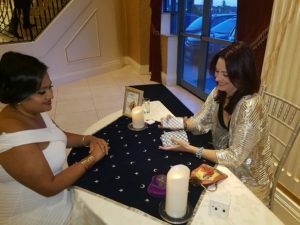 Inner Goddess Tarot offers a flat rate that can be paid by the party host, or an individual rate dependent on the number of guests or the length of the readings. Lori is located in Toronto, Ontario, Canada. Contact me to discuss your booking – Inner Goddess Tarot is flexible and open to your specific needs. Thank you Lori for making my party such a success. All my friends raved about your accuracy and your insight. I will refer you to everyone !!! Lori was an absolutely amazing addition to my friend’s bachelorette party! She was in high demand for the entire evening, actually we had to ask her to stay longer than we planned. She was very adaptable to the needs of our party. All of my guests raved about her and insight and down to earth approach. I most definitely recommend her service and would hire her again in a heartbeat! *pricing can be scaled to accommodate your event – we want to work with you! Contact me below to discuss the details of your party/event booking!